This is a fun and easy way to serve fruit salad! 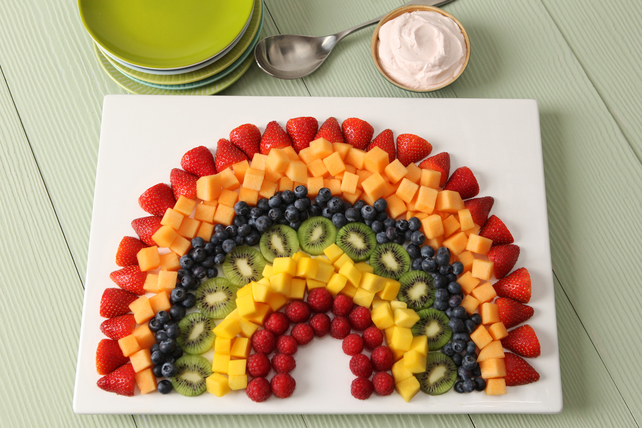 Arrange fruit in arc shape on large platter to resemble rainbow. Mix cream cheese product and lime juice in medium bowl with whisk until blended. Stir in Cool Whip. Substitute one or more of your favourite fresh fruits, such as cherries; blackberries; sliced navel oranges, nectarines or plums; and/or cut-up pineapple; for one or more of the fruit choices listed in recipe.